Some of the earliest observations of microplastics in the environment date back to the early 1970’s, when pre-production plastic pellets and small plastic fragments were found on the sea surface of Sargasso Sea, coastal waters of New England, USA and North-western Atlantic. Already then microplastics were collected using nets with small mesh size, and similar methods are still in use. Nowadays most of the microlitter samples are taken with so-called manta trawls and neuston nets, which are slowly pulled alongside a boat to collect small particles (usually >330 µm) floating on the sea surface. Using towable nets is a constant struggle between large filtering volume of seawater and catching also the smallest fractions of microplastics and other microlitter. Large mesh size enables filtering large volumes, which is important since microplastics can be scattered in the surface waters in relatively low concentrations. On the other hand, large mesh fails to catch the smallest particles, which would be caught in nets with small mesh size. The downside of small mesh is that it can get easily clogged by algae and zooplankton resulting in decrease in filterable water volume. Also the risk of significant error in the assessments of microlitter concentration in water increases when small volume samples are taken. The reason for this is airborne contamination (fibres) during sampling and sample processing, and the multiplication of error when the results from small samples are presented per cubic meters. Generally, the mesh size of approximately 300 µm is most commonly used around the world. Despite this consistence in sampling equipment, sometimes comparability of different studies is hard since they use different size categories of plastics and different units (numerical abundance or mass in m-2 or m-3) when reporting their results. Microplastics are shown to be ubiquitous on the sea surface both in the northern and southern hemisphere, from the coastal areas to open ocean. Their abundance in the surface waters seem to vary considerably from zero to hundreds of thousands of particles per square kilometer depending on the area studied. Thus, the distribution of microplastics in the environment seems to be quite patchy, which can be partly due to differences in proximity to sources, and both large-scale and small-scale circulation patterns on the sea surface. In the Baltic Sea the concentrations of >300 µm microplastics in the open sea areas have been found to vary between <1 to a few particles m-3. However, a recent study from the east coast of Sweden found higher concentrations of surface microplastics close to the city of Stockholm compared open sea areas. Furthermore, the observed concentrations of microplastics can also vary temporally due to recent weather conditions. It is for example suggested that the microplastic concentrations calculated from the surface tows may be underestimations since even moderate wind conditions can mix the surface layer and distribute microplastics deeper in the water column where they are out of the reach of surface trawls. The results of an observational study conducted in the North Atlantic subtropical gyre has indeed confirmed that although microplastics were most numerous on the mostly studied surface layer (0–0.5 m) they are present also subsurface especially during strong winds. Average concentration of microplastics in surface waters (ranges in parentheses). Note different units in the reviewed studies. The composition of microplastic pollution in different areas seems to be highly variable. Many studies report that hard fragments are the predominant category of floating microplastics: for example in the western Mediterranean Sea fragments accounted for 73% of found particles and in the South Pacific subtropical gyre 79.3%. In the North Pacific central gyre thin plastic films were the second most common category after fragments and accounted for 29.4% of all microplastics less than 4.75 mm. On the other hand, on the coast of Korea the most abundant microplastic material type (2–5 mm) was found to be Styrofoam, although in some other areas, such as in northern parts of North Atlantic Subtropical Gyre, fibers seem to dominate. Despite being commonly found from the seafloor sediments, fibres are not so often reported from the surface samples. This can be related to their small diameter (for example cotton fibres are as small as 20 µm in diameter), which enables them to slip through the sampling net. The effect of mesh size on the collection efficiency of surface water fibers was studied by taking samples with two devices using different mesh sizes (330 µm and 50 µm). Fiber concentrations were multiple times higher in the samples taken with smaller mesh and similar increase in concentrations was found also in abundances of other microplastic types – the smaller mesh collected two orders of magnitude more microplastics, which indicates that a big proportion of particles can escape from the regularly used 330 µm mesh. Even though pre-production plastic pellets are frequently found in marine litter surveys, their proportion among other microplastics is usually, but not always, relatively small. For example in the Western tropical Atlantic Ocean their proportion was 1.6% of all microplastics and in the North Pacific central gyre they accounted for only 0.16% of all plastic pieces collected with neuston nets. Additionally, it has been observed that the average proportion of resin pellets among floating marine microplastics has decreased during the past couple of decades in the North Atlantic subtropical gyre. This trend has been indirectly noticed also in the diets of marine birds in the Atlantic Ocean, but also in south-western Indian Ocean, Bering Sea and North Sea – the proportion of resin pellets have decreased and the proportion of plastic fragments increased. It is however not known if this is a result of decline in pellet concentration or increase in other types of litter. The modelling data shows that among these microplastics, larger particles (1.01–4.75 mm) seem to be more abundant than smaller ones (0.333–1 mm). Similarly environmental samples from the oceans show that there is a peak in abundance of plastic fragments 1–2 mm in size whereas particles less than 1 mm are relatively more scarce. These results are a bit peculiar when presuming that the fragmentation of plastic should result in gradual increase of smaller sized particles. It is therefore suggested that a considerable amount of smallest particles are removed from the sea surface due undefined mechanisms, such as sedimentation, shore deposition, ingestion and fragmentation into non-detectable particles. A study made in the Gulf of Finland, northern Baltic Sea, compared the commonly used manta trawl with 333 µm mesh size and a submerged pump lowered just below water surface and equipped with 300 µm or 100 µm filters. The concentration of microlitter was less than 10 particles m-3 in all studied locations (see table) and no clear trend was found from east to west. Non-synthetic and plastic fibres seemed to be the most common litter type, but also plastic fragments, paint flakes and combustion particles were found. Since the mesh size of manta trawl (333 µm) restricts the size of the particles captured, and does not give a thorough picture of the total microlitter/microplastic numbers the study recommends using smaller mesh size for monitoring of microplastics and other microscopic litter particles. 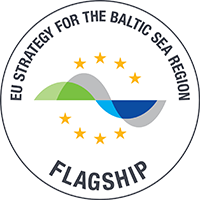 This is particularly important when assessing the potential risks for marine organisms, which in the Baltic Sea are generally smaller than in other seas. Many of the pelagic and benthic animals are probably unable to ingest particles over 300 µm and hence the monitoring should also include smaller particles present in the oceans. Studies of microplastic ingestion by organisms living in the Baltic Sea have been made and are discussed in section Plastic ingestion.